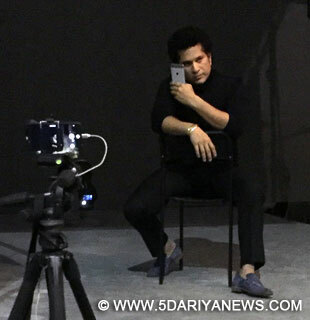 Homegrown technology and IoT company Smartron is rumoured to launch an exclusive Sachin Tendulkar-branded mobile phone in April which will be the first-ever signature series of the master blaster for a mobile phone brand.Industry sources told IANS that Tendulkar was recently spotted shooting at a studio in Mumbai for Smartron that is working on their next device under the project name "Rimo SRT". This will be their third device in less than a year, earlier ones being the t.phone and t.book.The device, that was seen being used during the shoot, appeared to have back finger print sensor and cricketing legend's signature, the sources told IANS. The company, however, declined to comment on it stating that "we will in due course of time announce a range of devices in mobile, laptop, wearable segment".Priced at Rs 24,999, the company last year launched t.phone which sports a dual-tone colour scheme and comes in classic grey, metallic pink, steel blue and sunrise orange. The 64GB device has a 5.5-inch, full-HD Super-AMOLED display with 401ppi and is powered by the Qualcomm Snapdragon 810 processor. The company has not customised the user interface and, running on Marshmallow, the t.phone delivers stock Android experience.